We Complete ALL the Activities! 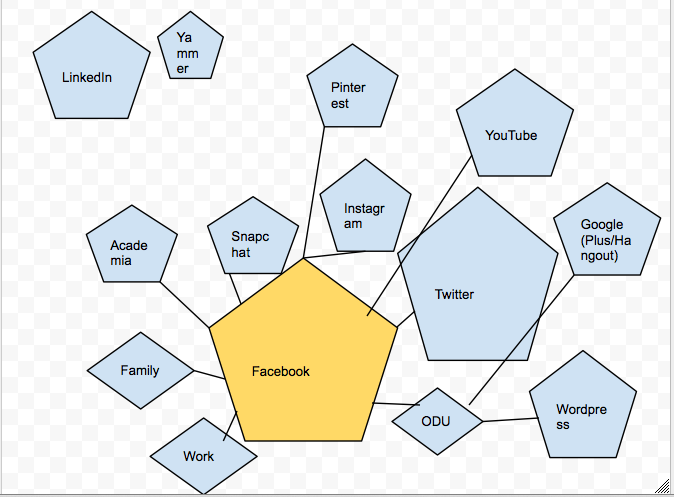 This is my map of my social networks, such as it is. Rather disorganized and true to life. So, I dabble and muck about in Social Networks. There are probably others. 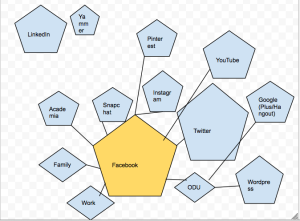 My main one, since I am old, is FaceBook, which is a hub of connectivity for ODU, where backchannels and groups build community. In fact, I don’t think I ever saw the real potentiality for FaceBook until I started using it as a doctoral student at ODU. I also keep in touch with former students, colleagues, high school and college friends, and I follow a few artists, but I don’t use Facebook as a Fan. It never made much sense to me to “like” Mark Twain’s page, when it was just some other bloke who “likes” Mark Twain. I do not play Facebook games and I do *not* post things that dare you to post them. I use Twitter to follow trends and as my reader. I follow NY Times, Atlantic, Economist, The Nation, Chronicle of Higher Ed, Washington Post, etc. etc. etc. I go to Twitter and scroll through and click on embedded links to read stories. It’s more “serious” than Facebook, where the shares are about quizzes about princesses and Star Wars characters (and God forbid you ask me to challenge you to Candygram or something. No.). Twitter is EXCELLENT for networking and backchanneling at a conference. And good for asking a question and getting an answer pretty quickly! I am a dabbler in Pinterest, but it hasn’t caught on with me. Maybe it’s the visual format, maybe it’s the consumerism. Maybe both. I have started with Instagram because I want to be hip, but I’m not a huge picture-taker yet, and I currently follow many of the same people I see on Facebook. So it doesn’t have a lot of extra value for me; however, my younger friends are there more frequently. My college-aged children do not want me to be on Snapchat. It feels as if I’m snooping. Snapchat is cool for immediate connectivity and organizing people together quickly. But I’m not sure what social capital one gains when things are not archived. The capital is as ephemeral as the Snaps. I have a YouTube account and favorite channels, but I’m not a big contributor to YouTube.Used to add videos in my former job, but have no time or exigency currently. I have LinkedIn over all by itself because even though I am connected to many people in LinkedIn that I am also friends with on FaceBook or follow on Twitter, I use it for such completely different things. I put Yammer over there, too, because it is also professional, but I never really use it; I just belong because it looks cool at work to be on it. The others I dabble in to one degree or another. I don’t really use Google for Social Capital, but I could, I suppose.